I'm 68/168cm and 21 years old, I have big problem that can't do a handstand, planche, front lever and so on. I've been doing calisthenics for 1.3 years, I know that i have a very short period. I've started practice handstand for 5 months I can do it yet. I think that reason that I'm so heavy and weak than my strength and balance ability and I think I can do those technique if I practice consistently, but I want to know efficient method whether i have to practice many techniques after lose weight or keep now. please let me what should i do! thank you. Thanks for posting. What sort of programming have you been using lately for your bodyweight training? Have you been gaining mostly muscle? To achieve the skills you mentioned, you should definitely be starting on the GymFit Subscription Foundation and Handstand workouts. umm I've been doing training based on strength such as wall handstand(5rx5) push up(5rx5), pull up, hollow hold(45sx7), Inverted hang and arch etc. I have so many different routine. I split my exercise into routine of nine such as Push-A/B, Pull-A/B, Core-A/B, Abs-A/B, Leg. A is isometrics and B is dynamic exercises, moreover I've practice handstand for 5~6times a week. If you can check my routine I actually want to list my exxercise routines this post. 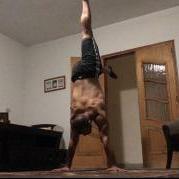 I relatively have low fat and high muscle mass, what do you think about that why I have difficult to do a handstand? simply short time period of training? If you think my weigh has big problem please give me advice and if it doesn't have problem I will practice a handstand more consistently. thank you Coach! Your next step should be to submit form check videos of your current handstand, planche, and front lever progressions. It's impossible for us to say without first seeing your technique. Are you following the Foundation or Handstand workouts from the subscription? If so, you can post videos in those sections of this forum. I'm not following those.. because I know I have to pay the price of subscription, right? so I haven't done yet however there is my handstand videos in my youtube channel (건호리). I've never started planche and front lever progressions, because I thought I have to clear handstand and then I can start planche.. but is it okay to practice handstand and planche training at the same time? who said that you need handstand before planche? No, thay's not it. it's only my opinion. It's my misconception by your reaction right?. did you see my video(handstand)? is it correct?? and I will practice planche if I achieve Planche plank(Planche lean) hold 60s x 5. what do you think about this? is it okay to do training like this? You handstand is not bad, head position can be improved and also shoulder flexion. PLanche and handstand can be trained at the same time. I’m not sure perfectly understood your mean but I know a few things about your thought. It is thnig that focusing on basic, am i right? Support hold it is not a basic training. Am I going to wrong progressions? -decent amount of bent arm pushing strength so that the stabilization muscles have good support on the unstable support. said that, without knowing your level I cannot suggest you to use specifically rings.